For this precious moment, the Mother of God took her eyes off her Son Jesus to gaze with love upon John, her new child in grace. John, the one disciple who had remained close to Jesus throughout His suffering and death, and who remained with our Blessed Mother as she stood before the Cross, turned and gazed with love upon his new mother in grace. This act of giving and receiving was not meant only for our Blessed Mother and for John. It was meant as a command for us all. We are all invited to be present before the foot of the Cross in the person of this beloved disciple. Jesus looks at all of us from the Cross and says, “Behold, your mother.” And He directs His own dear mother to turn to each one of us with love and affection, seeing her own precious child in each one of us. Our Blessed Mother is the new Eve, the new Mother of All the Living in the divine order of grace. She is the Mother and Queen of the new Kingdom and the new Family of God. If we wish to be members of that new Kingdom of Grace, we must lovingly accept our new mother. John took our Blessed Mother into his own home, loving her and being loved by her. Mother Mary’s maternal care for John enabled him to embrace the will of God until the end of his life. We, too, must take our Blessed Mother into the home of our hearts and embrace her as our own. She, in turn, will embrace us and point us to her divine Son. Reflect, today, upon these beautiful words of Jesus. Hear them spoken to you. Hear Jesus say to you, “Behold your mother.” Behold the Blessed Virgin Mary, the Mother of God and the Queen of Heaven and Earth. Turn to her, love her and receive her motherly guidance and care. Allow her to embrace you and to welcome you into her heart. My dearest Mother and Queen, as you stood before the Cross of your Son, the one thing that drew your eyes from your Son was the invitation from Jesus to behold your new child in grace. I am that child, dear mother, and I thank you for the gaze of love you bestow upon me. My dear Mother, I accept you into the home of my heart to be my spiritual mother in the order of grace. I accept you as my queen and seek your maternal care and guidance. Draw me to your divine Son, dear Mother, and pray for me that I may seek Him above all else in life. 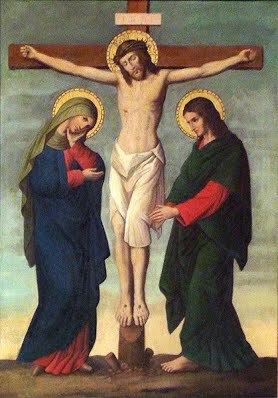 My loving Lord Jesus, as You hung upon the Cross, Your deepest desire was the salvation of souls. From Your Cross, You look down upon me, a lowly sinner, and entrust Your own mother to me. I thank You for this unfathomable gift and I accept the maternal care of the Queen of the Universe and the Mother of All.